THE African National Congress has occupied a huge space in the minds of many South Africans over many decades. It could also be argued that at one stage, it carried more hope than all other anti-apartheid movements combined that the vicious apartheid system would one day be crushed and replaced by something more humane, more caring, and more uniting. Just hearing people evoke the names of Nelson Mandela, Walter Sisulu, Govan Mbeki, Joe Slovo, and many others sufficed to keep the hope going. 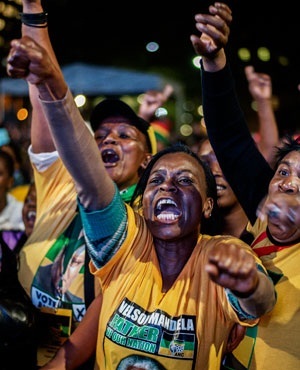 The dream of a free and united South Africa began to become real when these men and women were released from prison in the early 1990s, when others returned from decades of political exile and when various anti-apartheid movements were unbanned. Unprecedented levels of excitement were in the air. For me, two poignant moments remain forever engraved in my memory. The first was when Nelson Mandela walked out of Victor Verster prison alongside his former wife Winnie Madikizela-Mandela, then considered “the mother of the nation”, power salute held high. The whole world was watching; and many of us were not sure whether to cry, dance with joy, or simply watch silently, totally awed by the historic spectacle unfolding in front of us. Many of us, who were either babies or yet unborn when Mandela was arrested in the early 1960s, had no idea what he looked like because any publication of his photographs was illegal during apartheid. The first time I got to see what he looked like was on the cover of the Sunday Times, in a photograph taken with former president FW de Klerk, shortly before his release. The second poignant moment for me was when, a few days after his release, Mandela came to address jubilant crowds at the FNB stadium near Soweto. The place was packed. We watched Umkhonto we Sizwe soldiers do mock drills in full regalia around the stadium while waiting for the old man to take to the podium. The level of pride in watching those men and women march freely within the borders of South Africa remains hard to describe. Unlike with the then South African Defence Force, I felt safe that there were finally men and women trained in the art of war who would not walk into my father’s house and arrogantly place their muddied boots on our dining room chairs, and ask threatening questions about leaders of political protests in our area. Few will deny the central role played by the ANC in undoing apartheid era laws to replace them with more progressive legislation, in line with our country’s Constitution and Bill of Rights, over the past 23 years. Despite their imperfect and often controversial implementation in some areas, black economic empowerment and affirmative action laws have opened doors for many qualified and deserving black people to be given a chance to prove themselves in key positions in government and the private sector. The journey has not been perfect; many have gone far and made a success of the opportunities they were given, and others have failed dismally. No doubt, there have been many instances of the wrong people being appointed into key positions on the basis only of their pigmentation or closeness to powerful politicians, or the wrong black-owned companies receiving government work they were ill-prepared to deliver. Sadly, much media coverage has focused on such failures, in some cases even giving the impression that black people are generally not equipped to take on important responsibilities. But the truth is more nuanced than that. There are thousands of black professionals and black-owned firms quietly going about doing excellent work in the private sector and in government. We hardly hear of them, precisely because they’re not making the kind of waves that cause enough sensation to attract negative media scrutiny and coverage. But many of the opportunities they received would not have been possible without progressive laws that have been spearheaded by the ANC. But none of the transformation successes of the past 23 years should shield the ANC from criticism where this is deserved. Sadly, this has become particularly so in recent years, especially after the arrival of President Jacob Zuma into office, closely followed by the phenomenon of state capture, which came to define his leadership. Instead of bringing him to order when an avalanche of anecdotal accounts of corruption directly linked to Zuma made its way into the public, the ANC chose to close ranks. Hundreds of millions of rands in public funds that could have been used to improve the lives of communities around the country were siphoned through corrupt tenders and business deals, with much of the money said to have been shipped into safe havens abroad. To many, the ANC is like an abusive lover. It has become adept at claiming to be the only one who can love us like no one else can, promising never to do it again, and making careless promises of expensive gifts neither it nor the country can afford, e.g. of bringing about the kind of economic transformation that will put land and control of the entire economy almost solely in the hands of blacks. It makes such promises because too many still believe it can reasonably deliver on them. It makes them to explore the vulnerabilities of poor blacks even at the expense of the fragile unity the country still needs in order to progressively arrive, one day, at a fully inclusive economy benefiting all South Africans. All indications are that the ANC we have loved for many years has run out of ideas and that for the sake of our country, it needs to stand aside to let others take the lead. The time is soon upon us for the ANC to walk the political wilderness, humble itself a bit, find its soul again, and redefine itself before attempting a comeback into our heart of hearts as a credible political force driven only by the best interests of South Africa and all her people. Nice post! I'm always excited to find out your point of view in a particular question and The African National Congress is not an exception.